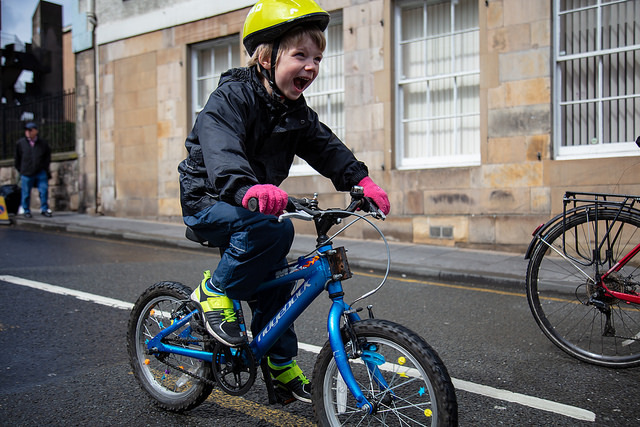 A school run by bike shouldn’t be a radical act – and yet in some cases it is. When a primary school is on a main road, and that main road has only the feeblest (and in some cases, dangerous) cycle provision, then the only way most kids will ever be able to cycle to school is en masse as part of a bike bus. The plan is to work with the school to run a ‘bike bus’ of kids and parents into school that morning. As well as showing that bikes can be a practical means of transport if the conditions are right – it should also be great fun. Find out more here and if you can help out or want to get involved then sign up on the event page. 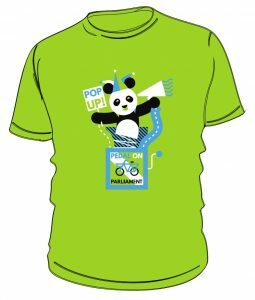 Note that Spokes Porty are also going on the school run at the same time to two local schools in Portobello with invited guests including politicians. This is being very much led by the children themselves so this is not a public event. Forrest Road offers the ‘perfect storm’ – poorly thought out traffic light timings mean that cyclists coming from the Meadows and drivers coming from the right both get a green light – while the painted cycle lane that ought to offer cyclists a modicum of protection is almost always illegally parked on. Even if drivers see cyclists, they often assume they have jumped a red light which just builds in the potential to create more conflict. This isn’t working for anyone. The plan is to form a chain of “human bollards” protecting the cycle lane from encroaching vehicles and offering cyclists safe passage out of Middle Meadow Walk, during the peak of the rush hour. You can find out more here or sign up to the event page if you’re able to come and take part. 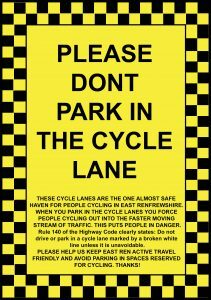 Almost 15 years ago, Stirling built a mandatory cycle lane on Causewayhead Road – but never put in the signage needed so that the police could enforce it – let alone the sort of physical protection that would make it genuinely useful to cyclists of all ages and all abilities. 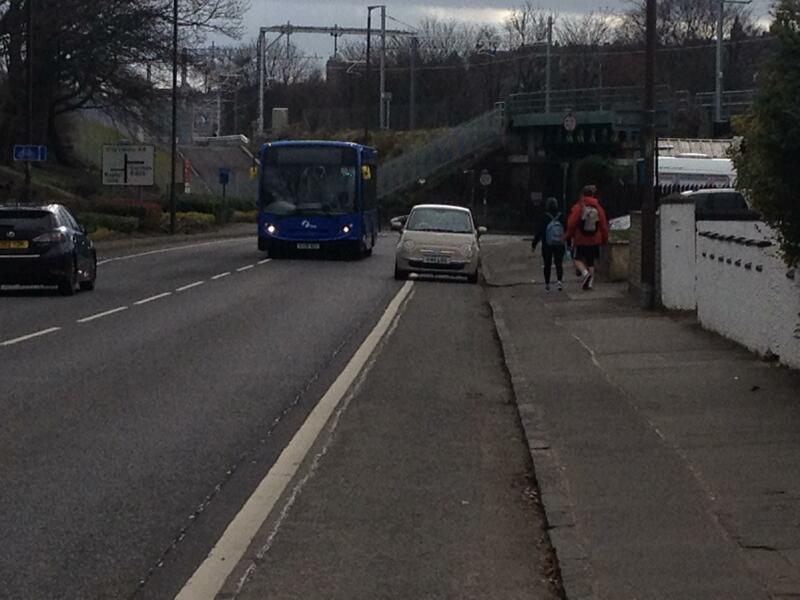 Tired of waiting for this to be corrected, the cyclists of Stirling are going to finish the job the council started. The plan is to gather early on Saturday morning to add the protection the council missed out – and provide the missing signage, if only for an hour! You can find out more here or sign up to the event page if you’re coming and can help out. 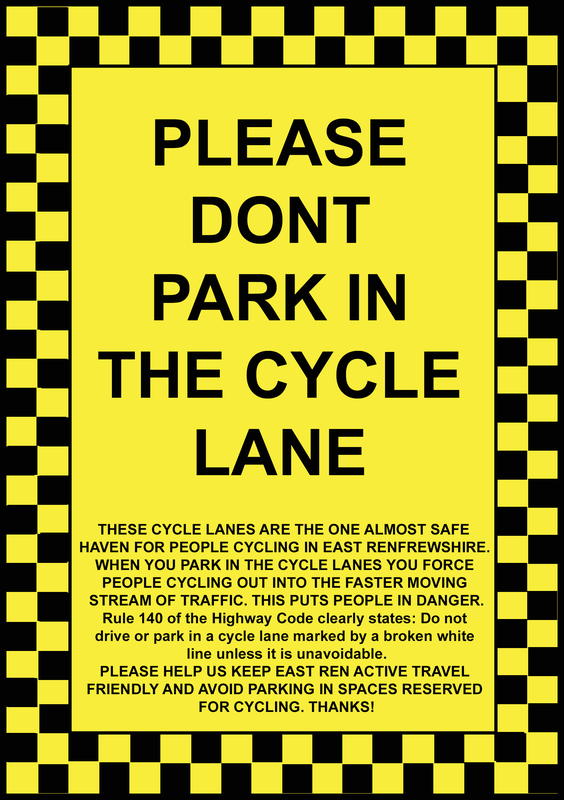 The cycle lanes on Ayr Road are some of the few safe havens for cyclists in East Renfrewshire – or they would be if they weren’t permanently blocked by parked cars. This widely-used bike route recently got downgraded from an urban clearway, practically inviting drivers to park in it (despite the Highway Code) and forcing people on bikes out into fast moving traffic. Add to that the dangerous layout of the junction at Whitecraigs Road encouraging left-hook collisions and you’ve got a bike route that puts people in danger rather than making them safe. The plan is to run a ‘hill climb’ with a difference – ticketing the cars that are parked in the lanes. Come ready to climb – or be one of the crowd of supporters (bring a cowbell!). Find out more here, or if you’re planning on joining in, sign up to the event page. Aberdeen has recently had an expensive bypass (which severed one of its better cycle routes) and yet the council seem determined to keep the city centre as car-dominated as possible. Well-designed cycling infrastructure (as envisaged here on Union St) would transform the city for the benefit of everyone. 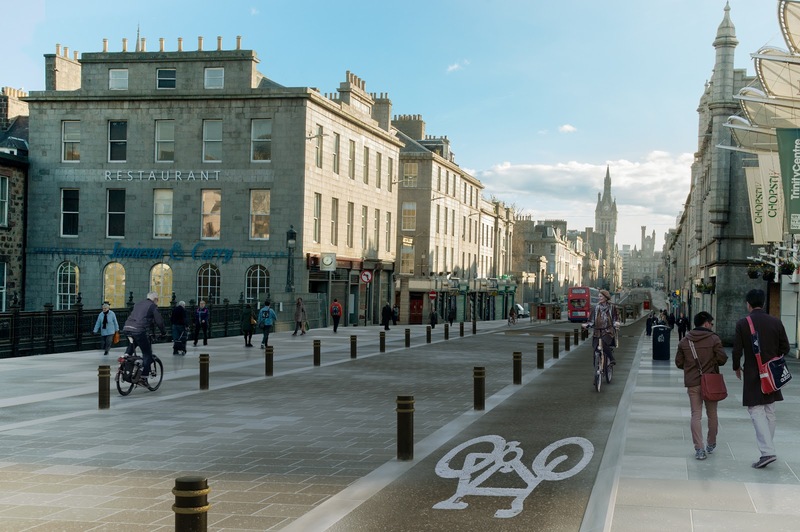 Join the Aberdeen Cycle Forum for multiple circuits of the city centre during an hour-long mass ride taking in Broad Street, Upperkirkgate, Rosemount Viaduct, Union Terrace, Union Street and back to Broad Street, for maximum visibility (and safety in numbers). You can find out more here or let the organisers know you’re coming by signing up to the event page. Dumfries’s cycling (and walking) network suffers from one persistent flaw – while there are some good off-road paths and routes, as soon as it comes to crossing the road you’re either on your own or stuck waiting forever for the green man, usually fenced in on an island in the middle of speeding traffic. 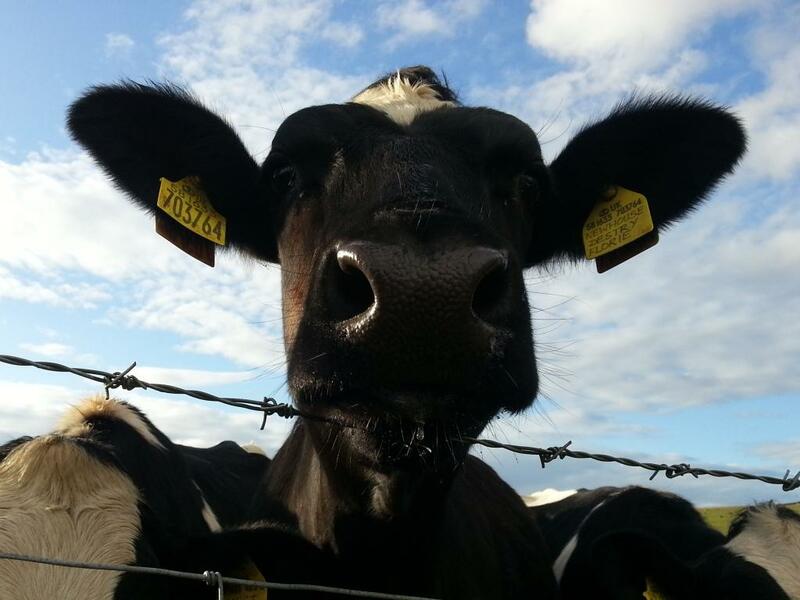 When the new hospital was built, staff wishing to commute by bike couldn’t get a toucan crossing of a busy road because it was too difficult – but cows get their own crossing of the A75! Deciding, if you can’t beat them, join them, Cycling Dumfries and others will be dressing up as cows and going on a Mad Cow Ride bike tour of the worst crossings in Dumfries – Dock Park, Cuckoo Bridge retail park, the McDonald’s crossing, the new hospital, Dalbeattie Road, New Abbey Road and the station, ending at the council buildings on English Street. There will be a family friendly version that sticks largely to the off-road routes, and a fuller route for those who are comfortable tackling the roads as they are (hopefully, cow costumes will add a bit of visibility as well as safety in numbers!). You can find out more here and if you’re ready to join the herd, sign up to the event page. Dundee has recently revamped its waterfront to great acclaim but is ignoring the elephant in the room – the massive road that severs it from the city centre, leaving Slessor Gardens as the largest traffic island in Scotland. Iconic museums and beautiful landscaping are all very well – but as long as motorised traffic remains king, Dundee will never live up to its potential as a city. The plan is to gather and ride around Slessor Gardens (on an off-road route) to showcase the need for a proper connection for people between the city centre and the waterfront. There will also be feeder rides from Broughty Ferry and Invergowrie. You can find out more here or sign up to the event page. At some point during the weekend, GoBike’s blackboard of shame will be putting in an appearance somewhere, wherever long-standing issues have been long ignored. Where and when it will be is a mystery – so keep an eye out for it if you’re in Glasgow! Not in Aberdeen, Dumfries, Dundee, East Renfrewshire, Edinburgh, Glasgow, or Stirling? Never fear – we’ve lots more events coming so watch this space and check out our calendar and map to see if there’s anything closer to home. And if there’s nothing tackling a particular issue near you – why not organise something yourself? There’s still time! If you have an idea, get in touch with us on hello@pedalonparliament.org and we can help you take it from there.